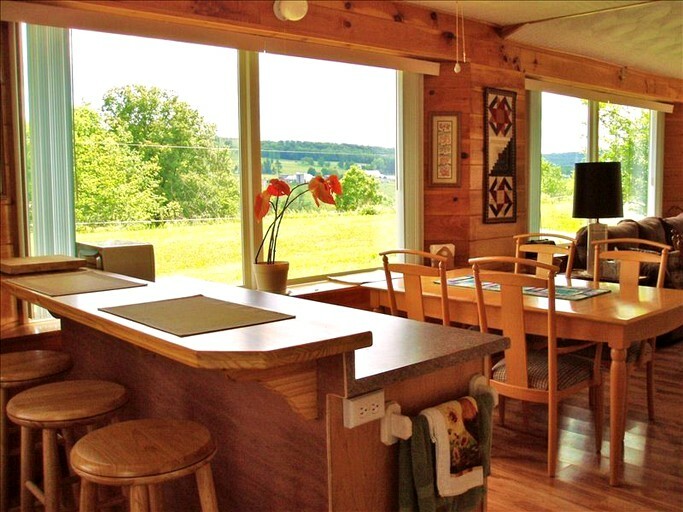 This secluded cabin rental near Ithaca, New York can comfortably sleep up to six guests. 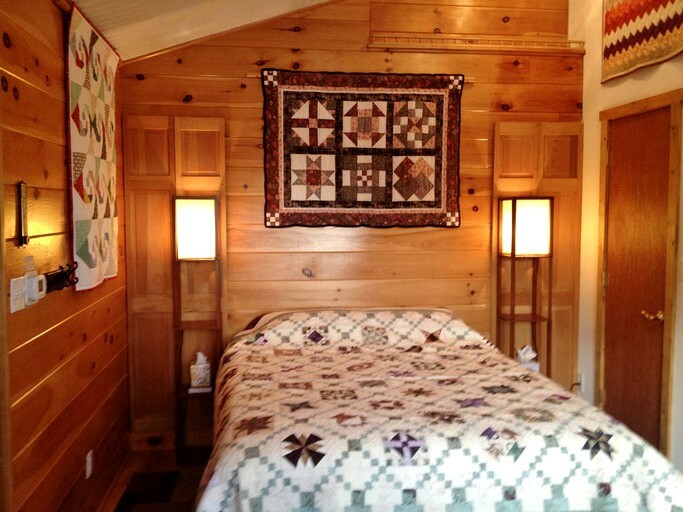 The recently renovated interior of the cabin features warm wood paneling adorned with tasteful decorations. 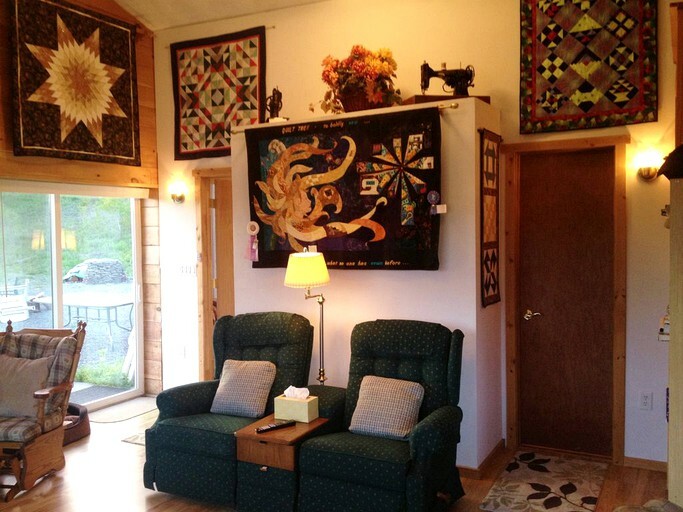 The entire cabin is decorated with over 25 nostalgic quilts hand woven by an award-winning quilter. 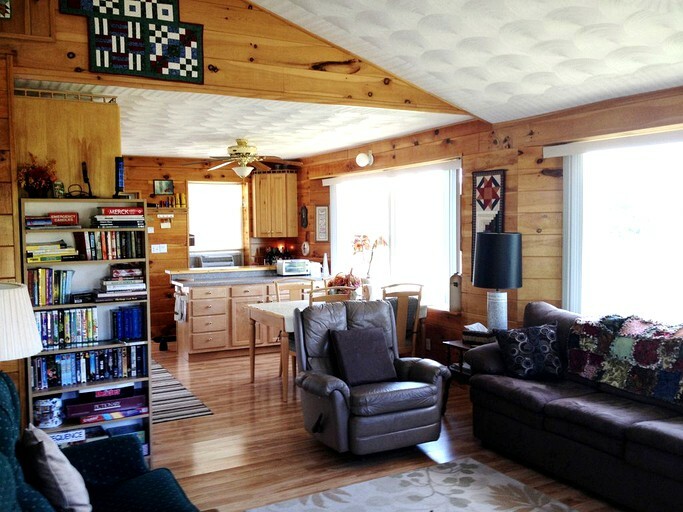 The kitchen and living room area is a welcoming open floor plan with laminate wood flooring. The living area features a 12-feet tall cathedral ceiling. The living area features and extremely pleasant seating arrangement including a comfortable sofa, two cozy reclining chairs, and a glider rocker chair. The living area allows scenic views of the property and is centered around a 50" flat-screen television with cable. The kitchen is fully outfitted with everything guests will need for preparing meals. The kitchen includes an oven, a stove, a refrigerator, a microwave, a toaster, a blender, a coffee maker, and a dishwasher. 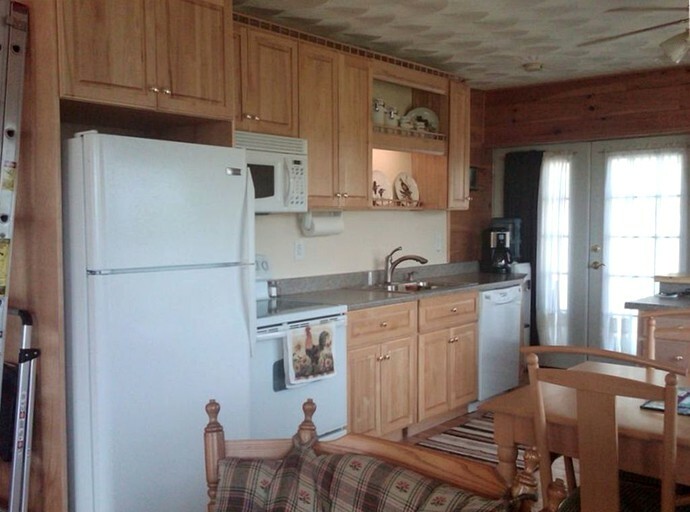 It also contains complete sets of cookware, dining utensils, and a fully stocked pantry. 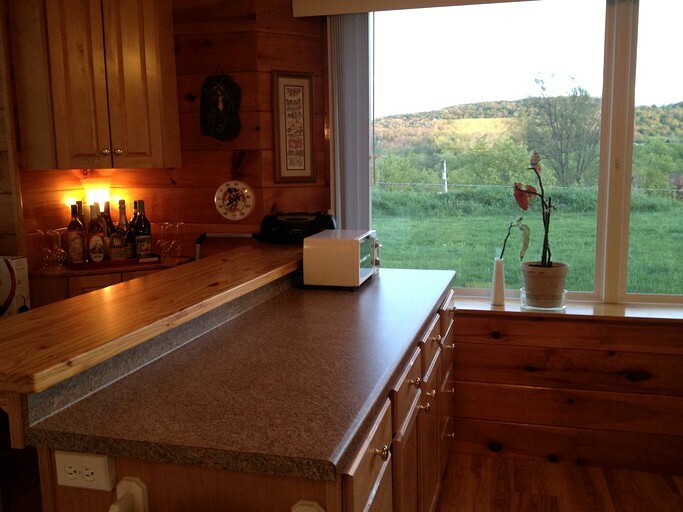 The kitchen is also tastefully decorated with nice countertops and a breakfast bar with seating for three. Additionally, there is a dining table with chairs for four guests. 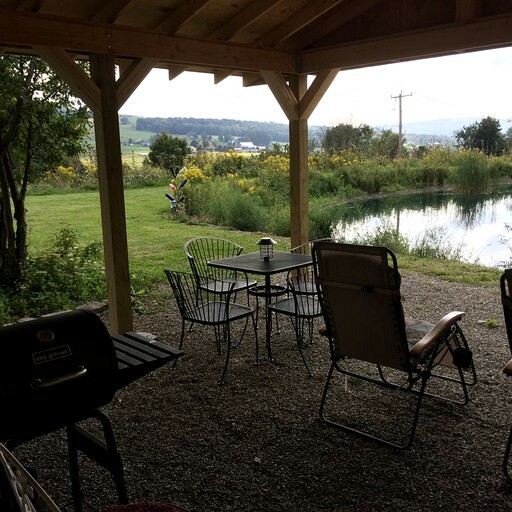 The back patio offers multiple covered outdoor seating arrangements that provide a relaxing space to view the pond and other surrounding scenery. 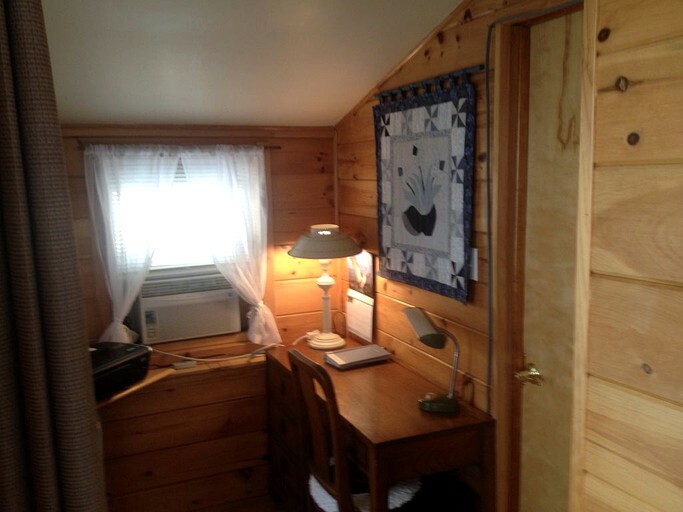 This beautiful cabin provides guests with air conditioning and heating for maximum comfort at any time of the year. 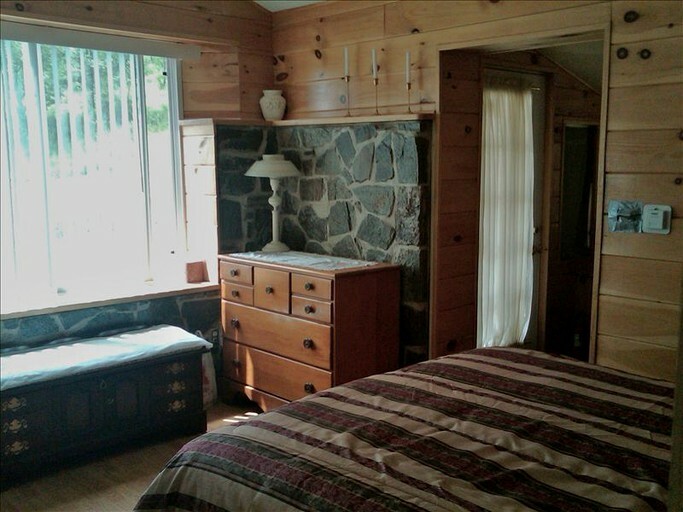 For additional relief, there is an electric fireplace and several ceiling fans. 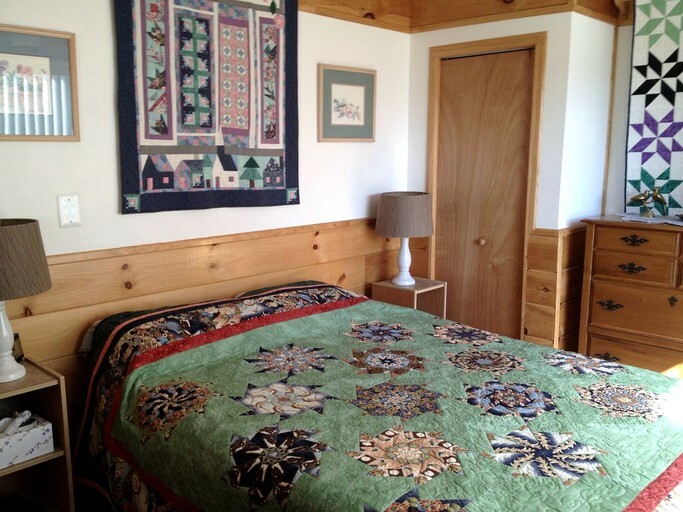 Guests are provided with quality linens, towels, and toiletries during their stay. To stay connected, this glamping site includes high-speed Wi-Fi and great cell phone reception. Just outside, guests will find a nice charcoal barbecue for grilling, as well as a firepit with firewood provided. 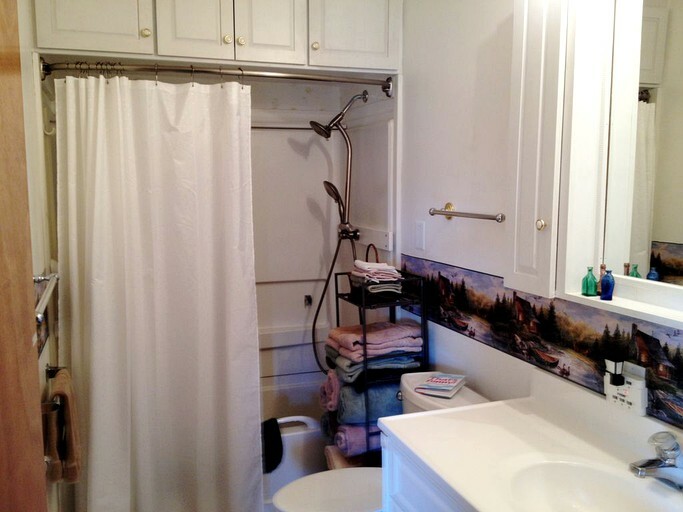 Other amenities include a washer and dryer with detergent provided, an iron and ironing board, and a cold water dispenser. 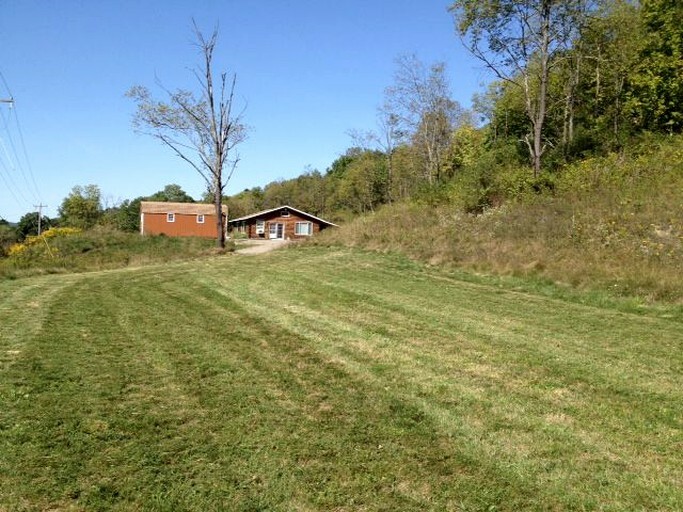 Guests can also enjoy ample parking for an RV, a trailer, or multiple cars. Fully stocked pantry with staple foods that guests can either use and replace or pay for items used. 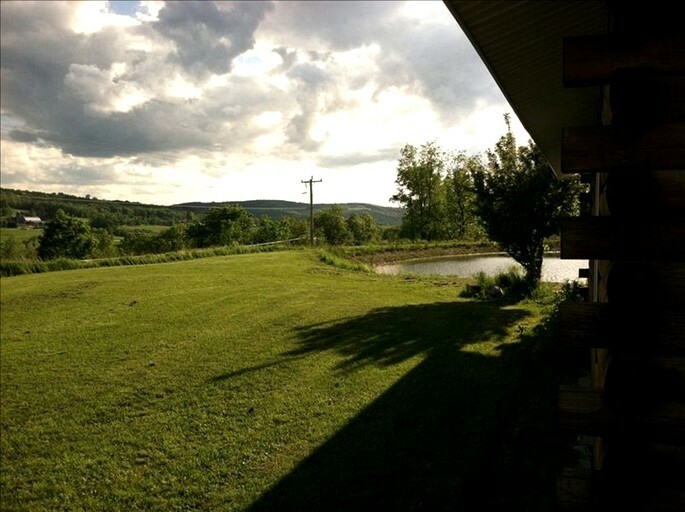 This impeccable location in the beautiful New York countryside provides guests with a variety of activities. Guests may enjoy staying on the property to explore the five acres, including a large lawn that is a perfect space for children or pets to play. 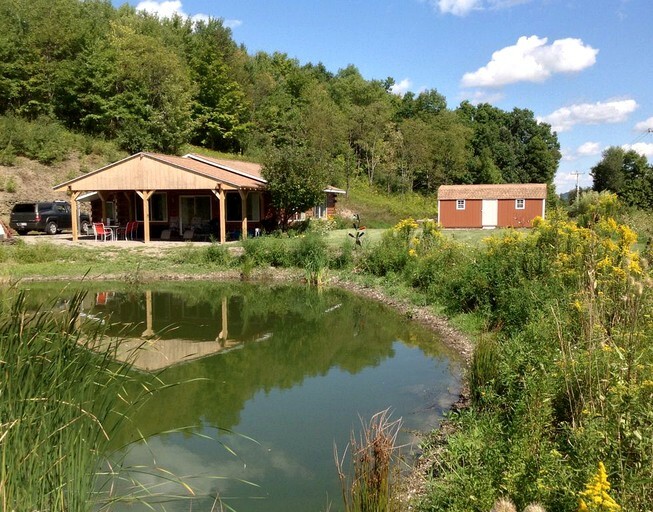 For any glampers interested in fishing, there is a large pond behind the cabin that is stocked with bass to ensure good fishing conditions. 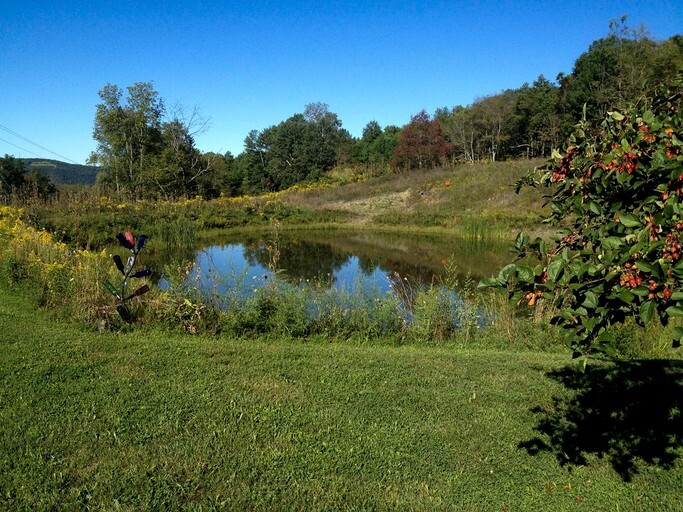 This pond is not only great for fishing but provides guests with high-quality ambiance and leisure space. 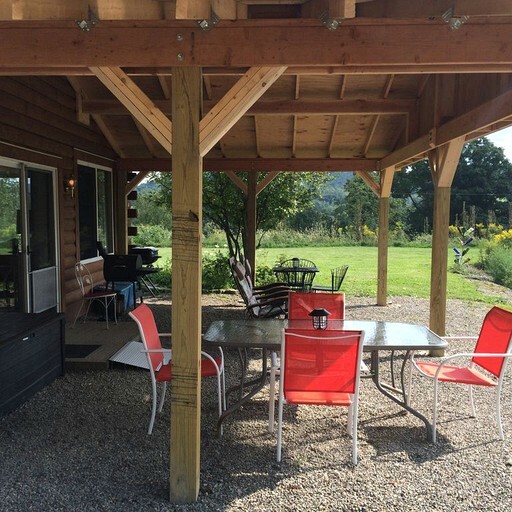 Glampers may enjoy relaxing in the back patio seating area while admiring the pond and surrounding landscape. 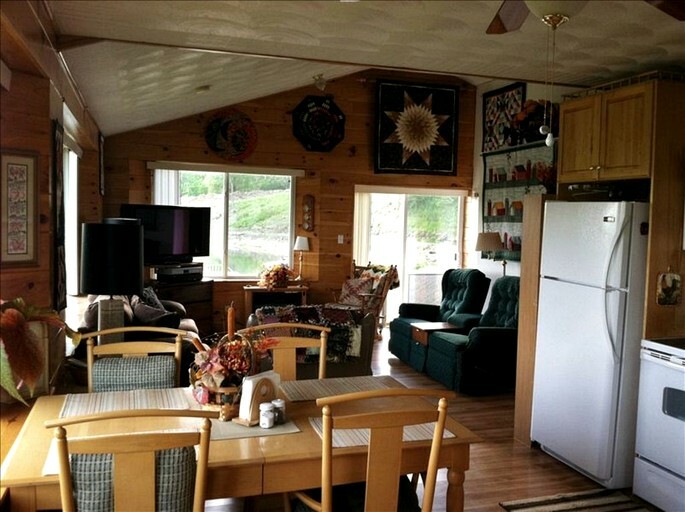 Other forms of entertainment found on the property include a book collection, board games, video games, a stereo, a DVD player, and even a 50-inch, flat-screen plasma TV with cable. 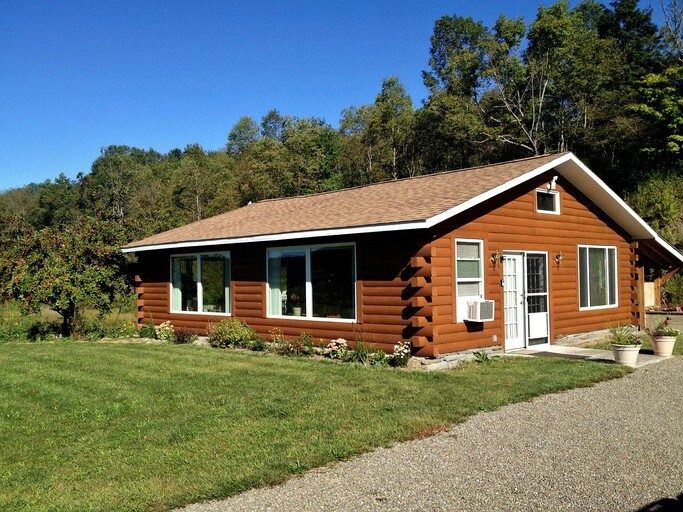 For those who wish to explore outside the property, the surrounding area offers great opportunities for hiking, cycling, mountain biking, snowmobiling, and skiing. 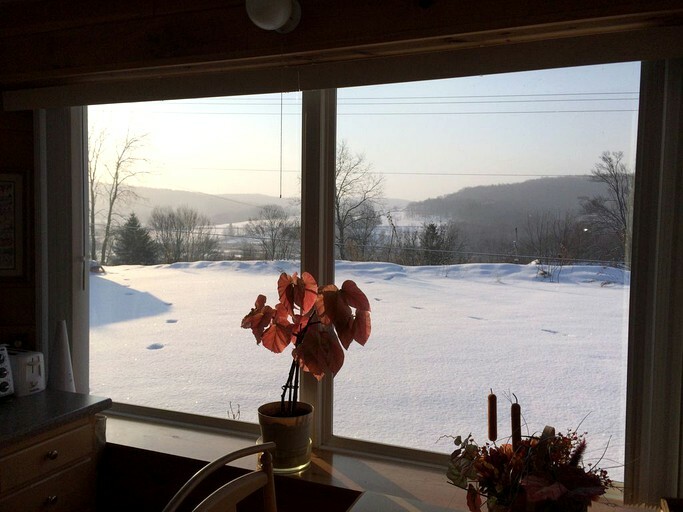 The lovely Finger Lakes area is an extremely popular destination. 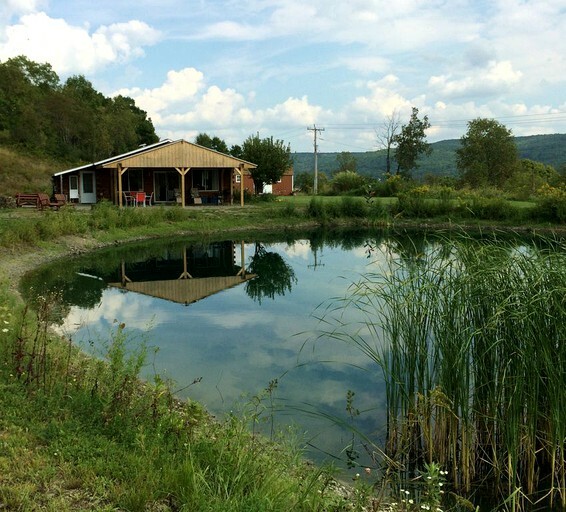 Glampers may drive to nearby Ithaca for shopping opportunities, to view one of the many gorgeous waterfalls, or to enjoy a high-quality dining experience. 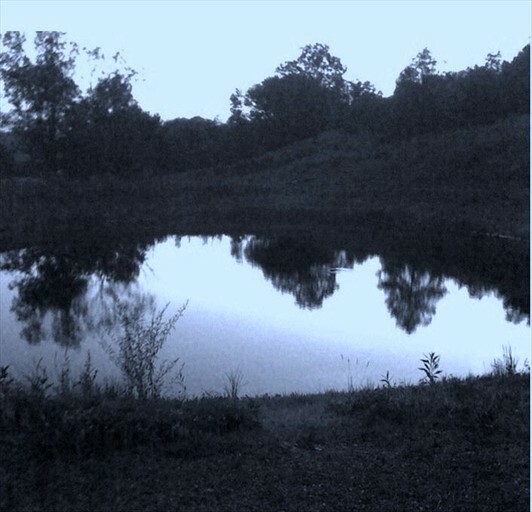 There are also multiple state parks nearby with hiking trails and opportunities for nature and waterfall viewing. 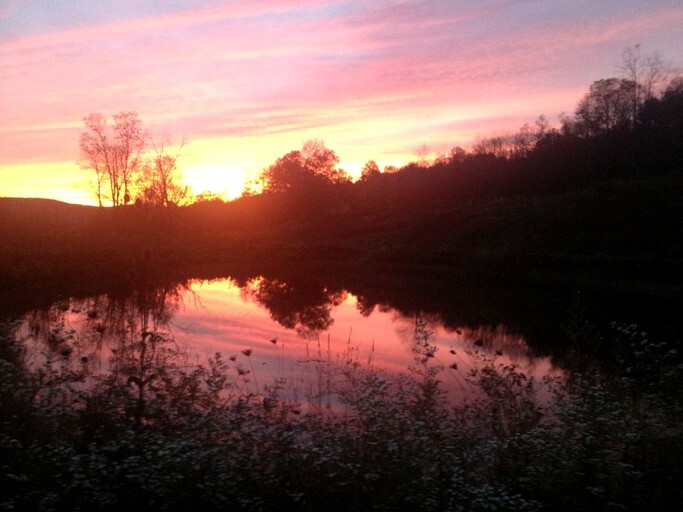 The entire area is so genuinely beautiful that guests are unlikely to run out of things to do during their relaxing time at the cabin. Pets are considered with a small fee for dogs.